Just off eastern edge of Mexico, the Yucatán Peninsula in one word: fabulous! We’ve all heard of Cancún, the American party destination for spring breakers—its overpriced, commercial and littered with tourists—this city should just be used as a starting point to exploring this region in Mexico. Contrary to popular belief, the Yucatán Peninsula is safe from the cartel violence associated with other Mexican States, and is home to some of the country’s richest history. The area is home to the best preserved Mayan ruins, crystal waters and white sandy beaches, Cenotes, and gorgeous Spanish colonial cities dripping in history. This is an overview of our one week route and all the nitty-gritty details of things to do, places to stop, what to eat, and more. We just used it as a layover spot for the night; didn’t see much- didn’t want to! Woke up early the next morning and went straight to the car rental company to get our car for our three hour drive to Mérida. 200 miles west of Cancun- the capital of the state of Yucatán. Many Mexicans agree on Mérida being one of the most beautiful cities in the Yucatán Peninsula. It’s also one of the safest in the country. 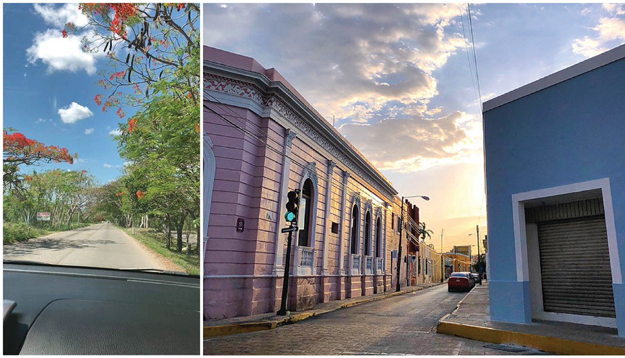 As you head into this region of the Yucatán Peninsula, the pace tourism drops off a bit – which is exactly what we wanted. Mérida is known for its stunningly colourful colonial streets and walkable city centre. • Pass an evening in the Plaza de la independencia in Mérida, it’s magical. The historic colonial streets make for pretty explorations, with the street vendors selling local artifacts and sweet treats. • The Big Museum of the Maya World in Mérida. This is a good place to tie together many of the themes and history from other parts of the trip. It has a wide range of activities and exhibits. Fiesta Americana Mérida, known as the most luxurious hotel in town: a 350-room high-rise on the posh Paseo de Montejo. Eating is basically the best thing to do in Merida and I planned entire days around what I was going to eat, which if you know me- I’m sure doesn’t come as a surprise! Chichen Itza is the most well-known and frequently visited Mayan ruins site in Mexico’s Yucatan Peninsula and it is also one of the New Seven Wonders of the World. It is also a UNESCO World Heritage Site. Due to its central location in the Peninsula – (its less than an hour away from Valladolid); it’s littered with tourists from all over the world. Although we wanted to only explore the lesser-visited places that are situated a little further off the main tourist path, Chichen Itza was a magnificent ruins site and it definitely warranted a visit. It’s just one of those must-see places, in my opinion. The trick, we felt, was to arrive at the ruins early to beat the insanely large crowds, tour buses and annoying vendors trying to sell you stuff along every pathway, which is what we did. We were able to enjoy wandering and exploring the ruins site in a peaceful and relaxed atmosphere. 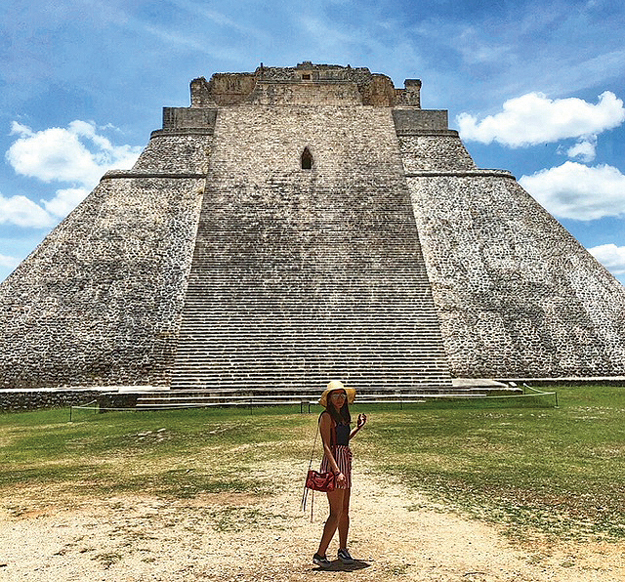 Although our plan was to seek out the lesser-known sights of the Yucatán, we couldnt leave without visiting Uxmal, a sprawling Mayan ceremonial centre that flourished in the fifth and sixth centuries. Uxmal is located on the western side of the Yucatan Peninsula in Mexico, about 80 km south of Merida. Roads are littered with police and highway patrol, that are NOT there to bother or harass tourists; their presence just reminds you how safe the Yucatan province really is. Uxmal is about an hour’s drive from Merida. DO stop along the highway to use the public toilets and food kiosks- another thing which took me by surprise was the cleanliness of all public facilities! • Uxmal is a UNESCO World heritage site. • The present name is derived from Oxmal, meaning “three times built”. • Pyramid of the Magician is a height of 115 feet. • The western staircase of the Temple of the Magician pyramid is built to face the sun during Summer solstice. • Queen Elizabeth II visited on February 27, 1975 for the inauguration of the site’s evening sound & light show. Valladolid is a quaint, sleepy colonial town in the Yucatan Peninsula, and gives you a glimpse into local way of life. There’s not a lot going on here, which is perhaps why we liked it. It’s also a good stopping off point on a day trip to Chichen Itza. — The cathedral on the square makes for some nice pics, and there are a few stores and cafes around the square to kill a few hours. — The small Maya history museum San Roque with free entrance. — There is also another quaint square near the San Bernadino convent, which is worth a look. Hotel Posada San Juan, which was lovely! There are literally thousands of cenotes in Yucatan. Cenotes are underwater sinkholes formed when limestone caves collapse, revealing these underground pools. 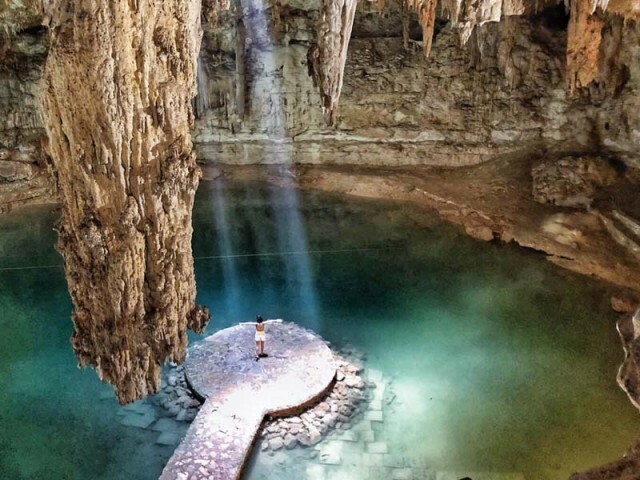 The entrance to the cenote is like something in a children’s book: a great hole in the earth, with a set of steep steps leading to a secret underground world. 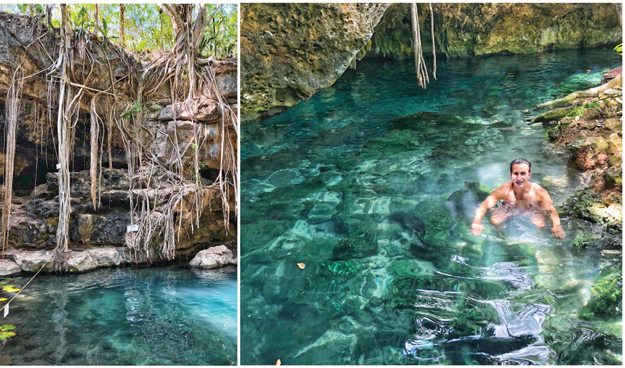 There are lots of cenotes (natural sinkholes) in Yucatan, and the lesser known ones are harder to find, but also way cheaper to enter and a lot quieter than the famous ones like Ik Kil for example. We decided to visit two cenotes to cool down after our Uxmal visit. We visited X Batun and Dzonbacal, known for being fun and very local. Xbatun is more open and has a bit of sun, while Dzonbacal is located inside a cave. Quite scary but really cool! There were a few tourists and Mexican families hanging around when we got there, but no more than 10-15 people. In total we visited six different cenotes! While I am severely claustrophobic and afraid of the dark, cenotes are worth a visit – each cenote is unique and mesmerising, and something you need to visit at least once in your life! The final part of our trip was Tulum. Tulum is famous for its soft, white sandy beaches and laid back vibe.The best time to travel to Tulum is during Mexico’s dry season from December to April. I would recommend budgeting a minimum of 4 days in Tulum. This is enough time to see the ruins, do a day trip or two if you want to and still have plenty of time to relax on the beach. The high end resorts are located on Tulum beach, a long north to south strip of land with the best beach access. You actually have to walk through a hotel property in order to get to the beach as there aren’t public access points from the main road. Dreams Tulum is the luxury hotel in the area: it is a luxury all inclusive resort with its own spa and views of the Tulum ruins along with scuba diving, amazing rooms and family friendly activities for the kids. Note: it’s not located on the beach strip. We stayed at Dreams Tulum for six nights, and opted for the full board. This five star resort has nine incredible restaurants with an all you can eat/all inclusive deal 24/7. From hamburgers being grilled in front of you on the beach to high end beverages, this resort has it all. Do try the French and Italian restaurants for dinner- they offer the best three course meals! Dreams also has its own private beach! 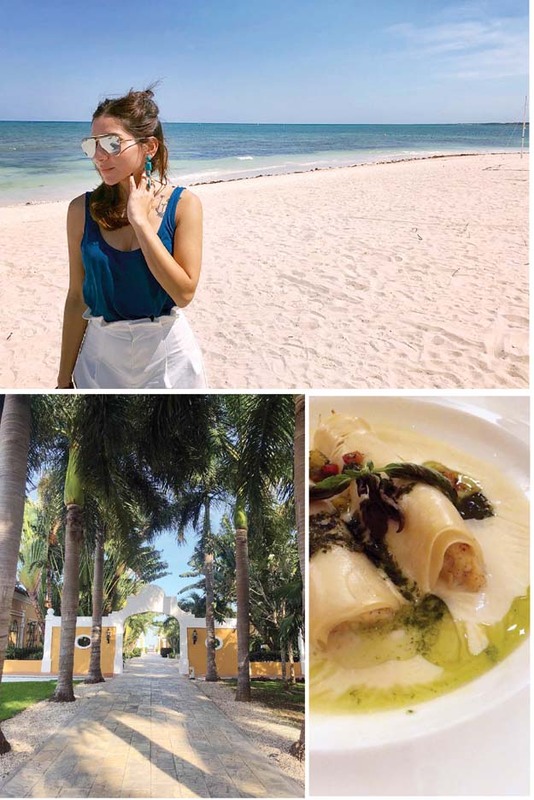 We were here for five nights and only left the resort once to see the Tulum ruins – the resort had the best food and beach – we didn’t feel the need to leave at all. DO venture out to explore the Tulum ruins if you get the chance- they are worth seeing! Plan to visit Yucatan between the end of October and the beginning of April. It is when the skies are clearest and the temperature is the most bearable. We visited in May and while some days were close to 36 degrees, it was breezy and bearable! All in all, travel to the Yucatan! Take the road less tourist travelled, and enjoy every day- you won’t regret it!